Bali wedding makeup artists are sometimes accused of not being up to date and in-line with international trends. And for many Bali wedding makeup artists this is true. Therefore, you should choose your Bali wedding makeup artists wisely. I am sure many brides will be excited to hear that. But, let me explain first why this matters. 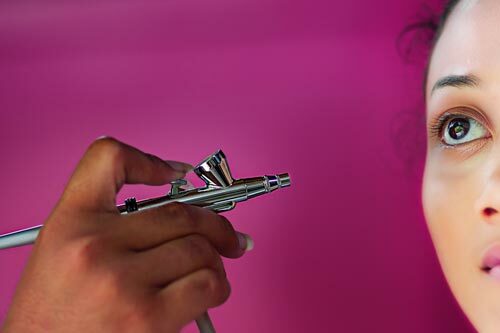 In recent years more and more top makeup artists around the world and particularly in the USA and in Europe, have embraced airbrushes as an essential tool for applying cosmetics. The advantages are obvious – more uniformly, smoother makeup. That in turn yields a more delicate look. That is because cosmetics such as foundation and blush can be applied with greater control and in very thin layers. As to my knowledge the Bali wedding makeup artists from BALI MAKEUP & HAIR are one of very few in Bali to use airbrush. Their Bali wedding makeup artists have undergone extensive training to master airbrush makeup. I recently had the opportunity to sit in for a trial session. I was impressed! Having my makeup applied with airbrush felt better than the conventional way. The cool vapor coming out from the airbrush feels nice and soft on the skin. And I have to say airbrushed makeup simply looks better. More sleek. Rather like a new skin than like makeup. So, ladies if you want a natural and sophisticated look on your big day I highly recommend you choose Bali wedding makeup artists who use airbrush. And for that BALI MAKEUP & HAIR may well be your best choice. The ladies did an amazing job. They arrived early and were very polite and professional. The makeup and hair was absolutely beautiful. I just wanted to say a big thank you to the girls for doing my hair and makeup with airbrush for my wedding. I have never felt so beautiful in my life!! I was very impressed with your stylist’s service and I was so happy with the results. I know I was in a bit of a panic on my wedding day so I didn’t really get to say thank you, so wanted to write to you to let you know how happy I was! My stylist was amazing and I would highly recommend her 🙂 Thanks for everything! You and your girls have been fabulous to deal with. Even yesterday they saw how busy I was and letting us pay later was so so lovely of you all. I really appreciate your trust. I cannot fault a thing. Everything was perfect. We all got exactly what we wanted. Our airbrush makeup lasted all night and looked amazing. Our hair was gorgeous. Maybe the bobby pins could’ve been put in a little bit tighter but it still stayed up great. Thank you all so much for your wonderful service and making us look and feel beautiful! Our wedding at the Pan Pacific on 5th April was picture perfect, and your stylists were absolutely superb. It’s been over a month since the Bali wedding and Nadia still raves about how professional, competent and considerate the girls were. She loved her airbrush make up, her hair do (especially the dual colored braid), and the way the stylist took care of her needs during the posh-wedding shoot. You made my bride very happy, and for that you get 5 stars! I would like to let you know how amazing my makeup was on my wedding day. The only thing that was worrying me looking ahead to my wedding in Bali was the makeup. I wanted nothing short of perfection – this was one thing that I did not want to go wrong. It turned out there was no reason to worry… Your stylist Emma did a fantastic job. Could you please tell her a huge thank you. Hai, saya bisa minta info untuk harga make up wedding airbrush ? Thanks sebelumnya. We dont sell services here on our website. We suggest you contact BALI MAKEUP & HAIR directly.